If you are a conservative, you know exactly how the argument goes. You say something “negative” about President Obama, and suddenly a wave of accusations hit you, including cries that you are “racist.” You could be talking about anything; his foreign policy, his executive order addiction, how Obamacare is making it harder for you to find insurance, etc. Somehow, in the minds of liberals, all of your criticisms come back to one factor: your assumed disgust with having a black man in the White House. Look at that conservative racist!! 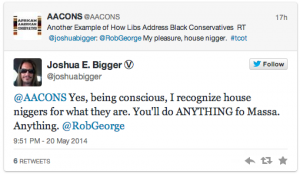 Oh, wait, that’s Joshua Bigger, an avowed Texas liberal who concerns himself with recycling, running, and calling black conservatives “house n****s.” You can look up this gem and more on his Twitter, or Google. “House n***r”, “Uncle Tom”, “oreo”; all of these are terms used by Democrats against conservative/Republican blacks, simply because they don’t subscribe to the ideology that liberals think they should. The Blacksphere bears the brunt of these racial slurs, due to the fact that they don’t agree with liberal politics. For the record, there are many examples of the Tea Party denouncing racism, despite the vitriol the left likes to spew. Not to mention the tea party members that organized a “BUYcott” in Ferguson to support the business that have been devastated by looting. Liberals, however, find it easier to believe what makes them feel morally superior, as opposed to what the facts support. Conservatives, generally speaking, are advocates of the pro-life movement, because they believe that every life is precious, and that abortion is murder. There are many articles debating when a “fetus” is “viable,” and when said “fetus” becomes a baby. 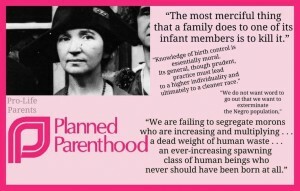 Liberals claim that abortion is a “woman’s right,” and should be widely available, and that conservatives want to push women “back 50 years” and “take away their ability to decide what happens to their body.” Planned Parenthood is their church, and Margaret Sanger is their deity of choice. However, they completely ignore – either by choice or indoctrination – the founding purpose of Planned Parenthood. 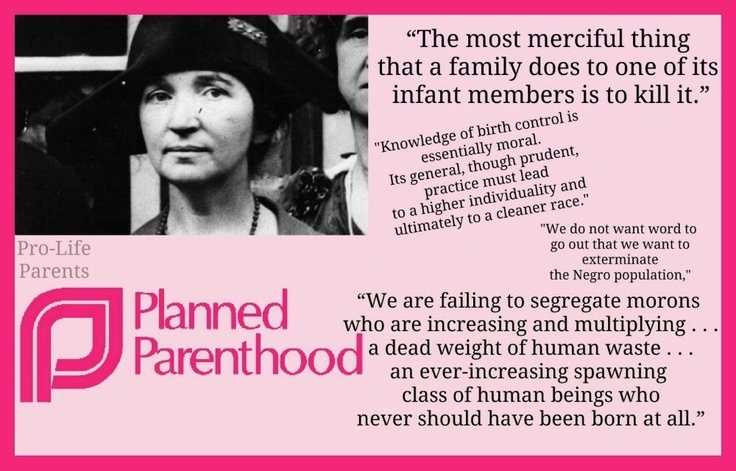 The entire purpose of Planned Parenthood was to create a “master race” and to eliminate “negros” and all other “undesirables.” Margret Sanger was a eugenicist who believed in persuading people to cleanse the gene pool by not reproducing. She worked with others to market her idea as “reproductive rights”, and a “woman’s right to choose,” and now millions of people buy into it. Conservatives believe every child has a right to be born, and has a right to have a chance in the world. They disagree with Planned Parenthood because of its founding purpose, and the fundamental evil that it represents. Something tells me that if it was conservatives pushing for more abortions, liberals would be screaming about how we just want to kill babies, and that we don’t value human life. LIBERAL TACTIC ALERT: If a conservative doesn’t agree with you, call them a “phobe” of some sort. You’ll notice this is a trend as you continue reading this piece. First of all, let me define “xenophobe” for you: “Xenophobia is the unreasoned fear of that which is perceived to be foreign or strange. It comes from the Greek words ξένος (xenos), meaning ‘strange,’ ‘foreigner,’ and φόβος (phobos), meaning ‘fear.’ ” (Thank you, bing.) This term doesn’t mean that you’re afraid of foreign people, specifically, but all strange objects you encounter. Liberals have twisted this term to mean a fear of immigration, and use it as a way to dismiss conservative ideas on border policy. Conservatives aren’t afraid of immigrants, legal or otherwise. We simply believe that this country is one of laws, not of men. Laws are meant to be followed, and illegal aliens break them to come into our country. We are appalled that these people are jumping the line, when there are so many others who are waiting patiently to become American citizens. Conservatives aren’t afraid of them coming into our country, we just want them to obey the laws, and thereby show respect to the country they want to adopt them as legal citizens. If they can’t show respect to the initial laws of becoming a citizen, how are we to expect they’ll follow any of our other laws? Conservatives, to the best of my knowledge, would welcome these immigrants – most likely fleeing from impoverished and oppressive countries – with open arms, and help them realize the American Dream, if they would simply follow our laws. LIBERAL TACTIC ALERT: See, I told you. Come to think of it, if liberals claim to be a group that fights for the rights of women, why aren’t they saying anything about the brutal treatment of women in Islam? Do they fear backlash from the Muslims? Wouldn’t THAT be considered Islamophobia? Food for thought. 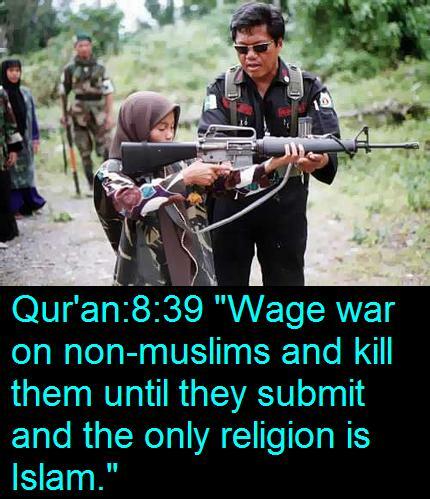 Conservatives realize that Muslims who follow the violent sections of the Quran are a legitimate threat to the West. If that DOESN’T scare you, it’s likely that you’re delusional. LIBERAL TACTIC ALERT: With all these “phobias” you would think conservatives wouldn’t leave the house. This one is just blatantly hilarious. Disagreeing with the homosexual lifestyle doesn’t mean you’re afraid of the homosexual. For instance, if you don’t agree with a friend about their partying, that doesn’t make you “partyphobic.” All it means is that you disagree with how they choose to live. Newsflash: Everyone is entitled to their own opinion. Is the conservative distaste for the homosexual lifestyle in any way, shape or form harming you? Speaking for myself, I personally don’t care. I’m just tired of having people announce they’re gay or lesbian like it means they’re special. If who you choose to sleep with defines you as a person, you have a problem. Humans are so much more than their sexual preferences, but liberals don’t understand that. They just attach themselves onto someone they view as “different” and “cool” and then deride those who question them. They pride themselves on having a diverse group where superficial differences such as race, sexuality, socio-economic class, ethnicity and gender mean more than ideas, values and morals. Moral of the story: Conservatives aren’t AFRAID of gays, we simply wish they wouldn’t identify themselves solely by who they sleep with. Author Note: I will be continuing this piece on myths in four different posts, so this won’t be a country mile long. Thank you for reading.